There comes a time every Summer when I just dread turning on the oven. It's already so hot outside and the AC is struggling to keep up; why would add any more heat to its load? Granita is the perfect thing to make when you want to avoid using your oven but still want something sweet. 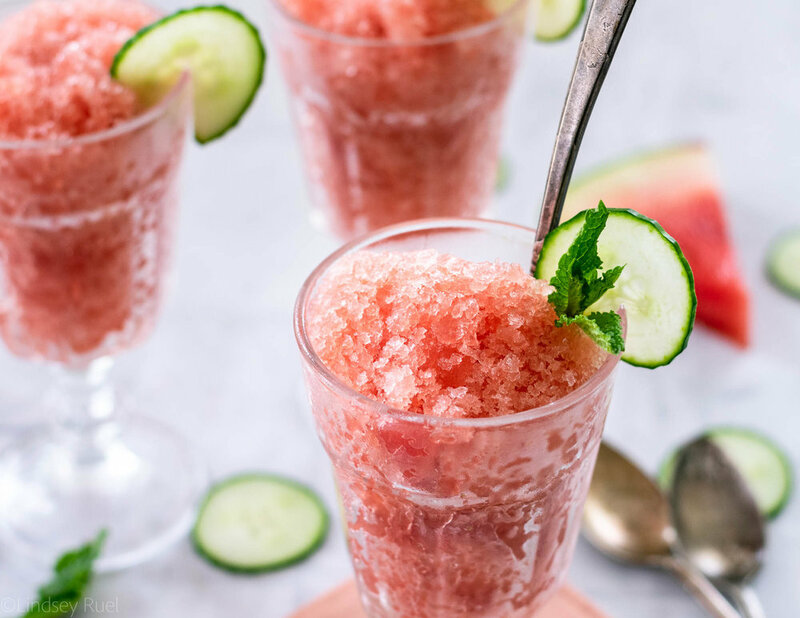 It's super refreshing (especially this watermelon cucumber granita) and super easy to make! 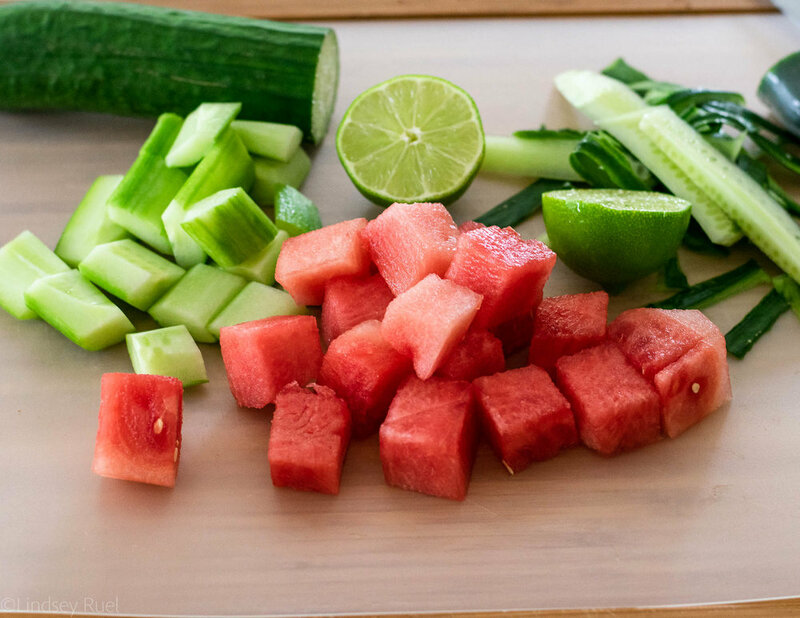 Start by chopping up a bunch of watermelon and cucumber. For something like this, you can leave the skin on the cucumber if you'd like. It will just get filtered out later. Add all the fruit and veg to a blender or food processor. The juice of a lime (or lemon), and just enough water to get the blender to do its job. If your watermelon is juicy enough, you may not need any! Pour the blended mixture through a sieve to strain out all the pulp. You should be left with a beautiful red juice that is seriously delicious. Honestly, you can stop right here and pour this over a couple ice cubes for a refreshing Summer beverage. But let's continue turning this into watermelon cucumber granita, shall we? Pour the juice into a shallow dish and then place it in the fridge. Every 2 hours or so (or every time you remember), take the dish out and scrape a fork over the surface. For the first few hours, it may seem like you aren't doing much. Once it starts to set up you will start making really fine ice crystals. It doesn't take too long to completely freeze leaving you with a beautiful (did I mention healthy?) dessert! I like to eat this watermelon cucumber granita all on its own. However, it would also be delicious alongside some vanilla ice cream or whipped cream if you need something a bit richer. It will definitely help you beat the Summer heat! 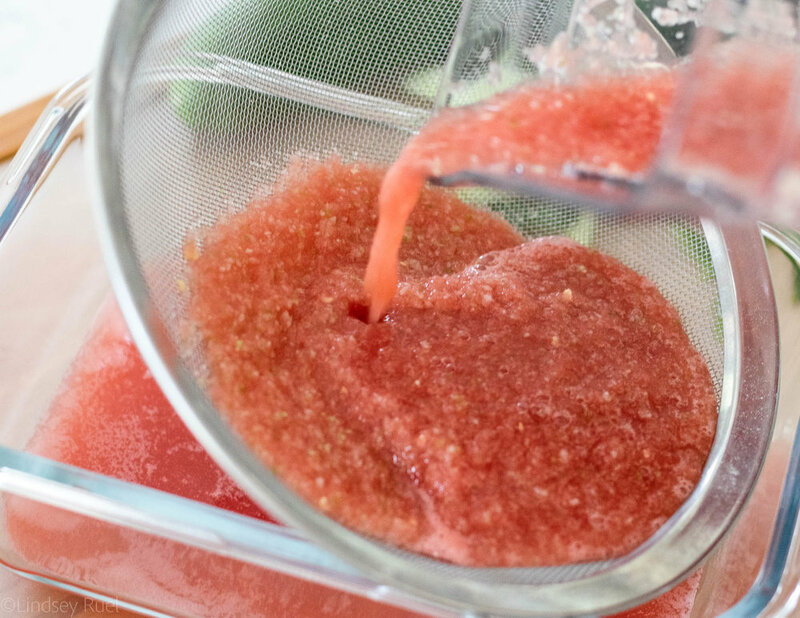 Add cucumber, watermelon, and lime to the blender. Blend until completely smooth. If the blender is having trouble rotating the blade, add some additional water. Pour the blended juice through a sieve and into a shallow dish. Cover the dish and place in the freezer. After 2-3 hours, remove the dish from the freezer and scrape the surface with a fork. Repeat every 2-3 hours until completely frozen.